Straus Organic 2% is one of my favorites! 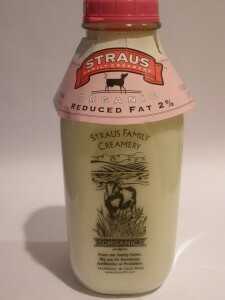 My Review – Straus Family Creamery 2% Reduced Fat Organic Milk Vitamin A – Non Homogenized, I love the glass bottle and the non-homogenized cream at the top. Reminds me of when I was a kid and we used to buy fresh milk. So, how does it taste? Absolutely delicious! This is my new favorite organic milk. You do have to be ready for the cream at the top and little bits of cream in the milk, just like the old days, but the flavor is very rich with no aftertaste. Great for all the organic milk uses!